Begin this tour in Creston where four wonderful wineries are located: Baillie-Grohman, Red Bird, Skimmerhorn and Wynnwood Cellars. The Creston Valley is a retreat for outdoor adventurers, foodies, creative souls and lovers of the land. Enjoy a tour, pick your own fruit, taste cheese, meet the cows, browse the art studios, view the murals, sample at the wineries and brewery. Salmo offers a quaint downtown, museum and rock murals. Take a side trip to Nelson (40 km north on Hwy#6). Nelson boasts a vivid past of Victorian architecture, cultural histories and a vibrant art scene. These qualities are complemented by world-class outdoor adventure plus great dining, shopping and lodging options. Ride the Streetcar #23 tramway at Lakeside Park & Prestige Resort. Wonderful farmers markets take place in summer every Wednesday and Saturdays. Trail, established in the 1890s, is set alongside the Columbia River. Stroll downtown Trail's 'IncrEDIBLE' Trail and help yourself to fruits and vegetables growing in sidewalk planters. The Columbia Gardens Vineyard & Winery is a small winery producing VQA quality wines that offers a quaint guest house for overnight stays. The free tour of the Teck Trail Interpretive Centre is a must-do. Trail to Castlegar is 26 km / 16 mi via Highway #22. Trail to Rossland is 7 km / 4 mi via Highway #3B. 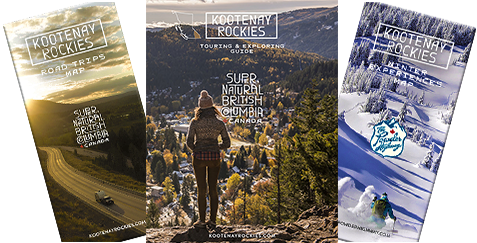 Castlegar is the centre of adventure; the home to an impressive network of trails, where hikers and cyclists enjoy the natural setting of the city and its vicinity. World-class fishing, kayaking and golfing are also popular. Enjoy the Millennium Walkway & Ponds, Doukhobor Discovery Centre, Zuckerberg Island Heritage Park, Train Station Museum, Sculpturewalk and more. Rossland, perched high in the Monashee Mountains, was the site of one of Canada's richest 19th century gold strikes. During the summer, the Gold Fever Follies present a live musical theatre show and a downtown Mountain Market takes place Thursday evenings. Rossland is also well known for its Seven Summits Trail, one of the most sought after cross-country / all-mountain bike rides in North America. Rossland to Christina Lake is 75 km / 47 mi via Highway #3. Christina lake is a summer family vacation destination. It offers a warm swimming lake, sandy beaches and mountain biking on the Columbia & Western Rail Trail. Highway #3 from Christina Lake to Osoyoos is 144 km / 89 mi via Grand Forks. Located at the confluence of the Granby and Kettle Rivers, Grand Forks is proud of its mining and Doukhobor heritage. Osoyoos is Canada's only true desert town, offering a plethora of First Nations culture, winery experiences and family recreation. Travel north on Highway #97 to Kelowna (123 km / 77 mi) via Penticton. Osoyoos to Kelowna is known as the 'wine route' and is BC's most productive area for vineyards and orchards. Be sure to stop along the way for a wine tour and fruit sampling. Penticton offers miles of beautiful beaches, wineries and orchard markets. Climb aboard the vintage Kettle Valley Steam Railway in Summerland. The beautiful lake-front city of Kelowna plays host to numerous outdoor activities as well as events, entertainment and the arts. Take Highway 397/97A north to Sicamous (127 km / 79 mi) via Vernon. The landscape surrounding Vernon is picturesque; see the O'Keefe Historical Ranch that highlights the beginning of ranching in the area. Armstrong is known for cheese, farmlands, produce and Farmers Markets. The town of Sicamous and the Shuswap Lake area are known as the Houseboating Capital of Canada. With over 1,000 kms of shoreline, Shuswap and Mara lakes (and vicinity) are perfect for boating, swimming, camping, fishing, hiking and biking. TransCanada Highway #1 goes from Sicamous to Revelstoke (74 km / 46 mi). Historic Craigellachie is famous as the point where the last spike was driven, joining the western part of the Canadian Pacific Railway to the segment built from the east. Attractions along the way include Crazy Creek Waterfalls & Suspension Bridge, Enchanted Forest, Skytrek Adventure Park, Three Valley Gap Heritage Town - all are excellent stops. Revelstoke, the gateway to Mount Revelstoke National Park situated below the Selkirk and Monashee summits, is a hot spot for backcountry adventure. The historic downtown offers Grizzly Plaza; the Revelstoke Mountain Resort offers gondola sightseeing and a mountain coaster. Drive the scenic 26 km (16 mi) Meadows in the Sky Parkway that switchbacks up the side of Mount Revelstoke. This is the only place in the national park system that you can 'summit a mountain' in a vehicle. Glacier National Park is known for 'firsts'. It was BC's first national park - here two British mountaineers introduced mountain climbing for recreational purposes in 1888. Enjoy the exceptional alpine scenery. Golden to Cranbrook is 263 km / 163 mi south on Highway #95. The mountain town of Golden is renowned for outdoor recreation and offers just about everything a traveller could want. Set in the Purcell Mountains, Bugaboo Provincial Park draws climbers from around the world to its airy, glacier-capped granite spires. Radium Hot Springs and Invermere have an extensive range of visitor services. And, hundreds of kilometres of world-class trails: Old Coach, Johnson & Kloosifier near Lake Lillian, Mount Swansea & Nipika Trails. Kimberley and Cranbrook both offer world-class mountain golf and an interesting history. The Kimberley Underground Mining Railway highlights the history of the Sullivan Mine. The Cranbrook History Centre showcases the largest collection of luxury travel cars in North America, including the restored Soo-Spokane Train and TransCanada Limited. Cranbrook to Creston is 106 km / 66 mi. Along the way, Moyie Lake Provincial Park offers a day-use area, camping, boat launch and sandy beach. Columbia Gardens Vineyard & Winery in Trail. Listen: Explorer David Thompson history.